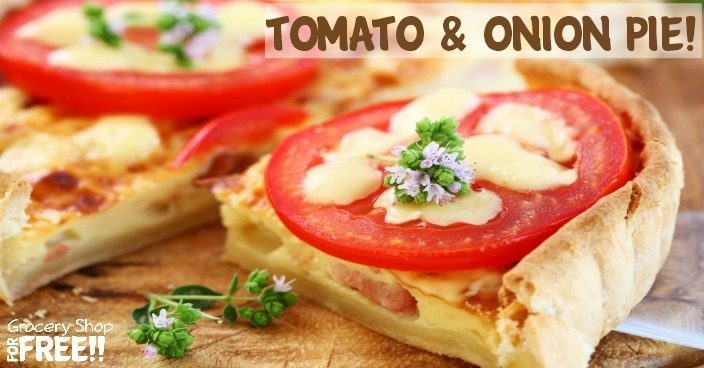 You are here: Home / Recipes / Tomato and Onion Pie! Susan is back and today she has chosen a really tasty Tomato and Onion Pie! I chose this in honor of Dian. Let me tell you why. Once she had a friend bring her a pie and she was very excited to taste it, naturally thinking it would be sweet. But, this pie was an onion pie and it was quite shocking to the tastebuds. But, I thought I would share with her ( and you) my recipe. I think she might like this one, though she doesn’t eat pie crust or anything with lots of fat. Hmmm…..
Now I use the term “my recipe” quite loosely because really, I took a recipe that I saw in Country Living Magazine and I changed it a bit to make it my own. But, basically, it first belonged to a woman named Tandi Hauss. I don’t think I have ever completely followed a recipe. Most of the time, I see something that I don’t think will work to my liking or I don’t have all the ingredients and I know something I could use as a substitute. Often, I just want to experiment. Let me say that I almost always buy my pie crusts now in the canned biscuit section. I only buy the kind you roll out, not the frozen one. I think they are really good and so much easier than making it yourself. But if you are a stockpiling or money saving mom, you will have to make your own crust. Then cook it long enough to brown it…not too much but say half way cooked. It also makes a nice arrangement. However, you will need to either put it in the refrigerator or dry it for later. You do that by preheating the oven to 200 degrees. Wash the basil and dry really well, picking off all the leaves. Place them in a single layer on a cookie sheet and dry in the oven for about 30 minutes. You will have to just check it periodically. It may take more or less time. Then just turn off the oven and let it sit for a couple of hours. 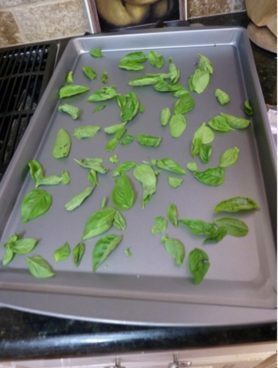 When you use it in a recipe, remember that dried basil requires less in a recipe than fresh. And, FYI, it doesn’t freeze well. Seems to lose it’s flavor. 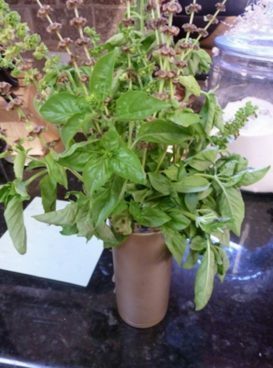 Grow one of these plants indoors and have fresh basil all the time. So here is my version of Tandi’s recipe. 1 cup chopped onion (Texas 10/15 is the best) Even though a red onion is in the photo….don’t use red. It didn’t taste as good as a yellow onion. Cut one of your tomatoes in half. Slice half of it thinly. The other half and the other tomato should be cut in wedges…not too thick. Remove the seeds from the wedges. Place the slices on a paper towel to soak up some of the juices…knocking out the seeds from these as well. The seeds will cause the pie to be too runny. In a bowl, mix together the mayo, Parmesan and 1 cup of the Pepper Jack or Chedder and the garlic. Layer half of the wedges in the bottom of the lightly browned pie shell. Top with 1/2 cup of chopped onions and a little salt and pepper. On top of this, put half of the cheese mixture. This will have to be kind of blobbed on and spread as much as possible. It won’t cover it but it won’t matter. Then, layer it all a second time in the same order. This time, try to blob the cheese mixture where it didn’t land the first time. 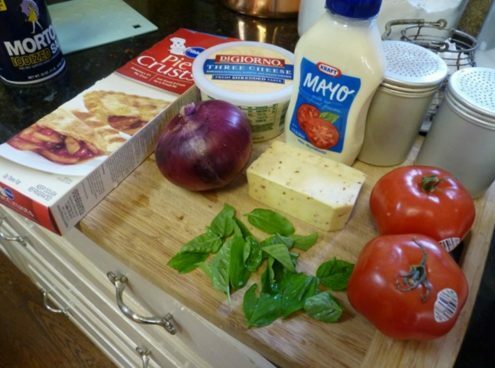 Top this with the remaining 1/3 cup of cheese and then lay the slices of tomatoes on top of this. Bake at 350 degrees for 30-40 minutes. Check it after 20 minutes to see if you need to cover the edges of the crust if it is getting too dark. Mine did not and was ready in 30 minutes. This is a good vegetarian meal, though it is not low fat…so…..eat at your own risk. Enjoy! Thanks for letting me know about your recipe link up! Thanks for linking up!! Looks great! I will have to start cooking!